Multi-Project: The following diagrams were created to illustrate various geologic processes, both general and specific. Many were based on existing diagrams and were adapted for inclusion in DOGAMI maps. These illustrations are an extremely useful method to convey complex geologic processes. 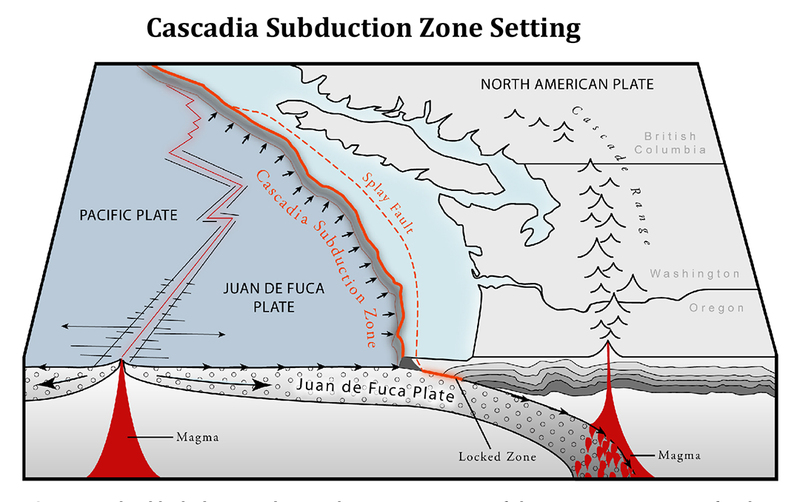 The graphic above of the Cascadia Subduction Zone was included on DOGAMI’s Tsunami Inundation Maps. It helps illustrate the relationship between the subducting plate boundary, volcanic activity, earthquakes and local tsunamis. 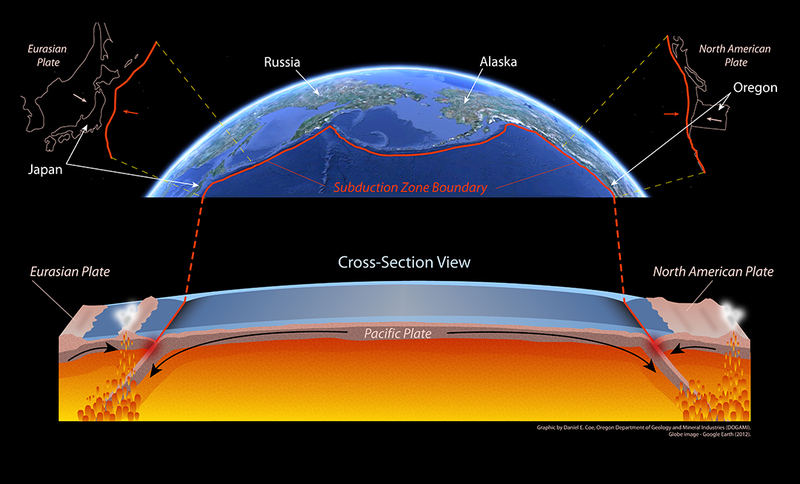 This graphic was created to illustrate the similarities between the subducting plate boundary in Japan and the one in the Pacific Northwest. 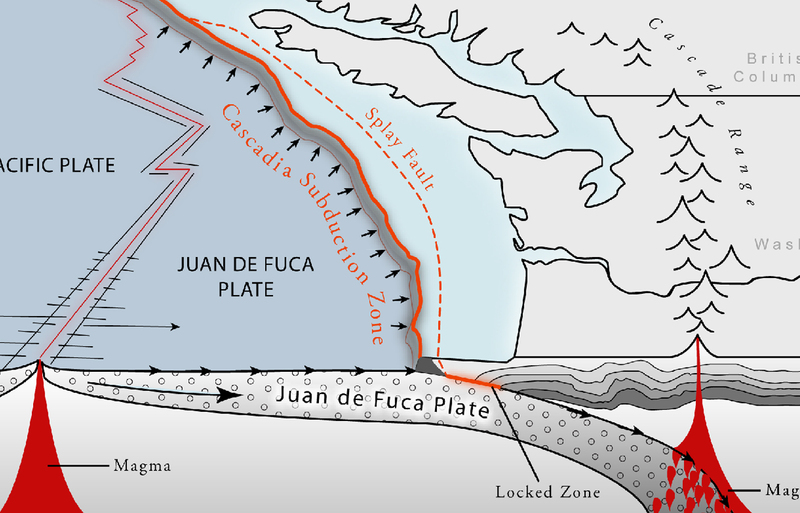 After the devastating 2011 Japanese tsunami, there was increased awareness that similar tsunami events have occurred and will occur again in the Pacific Northwest. This graphic is currently displayed on a large chunk of Japanese dock which washed up in Newport, Oregon, that is now used as a tsunami education exhibit. 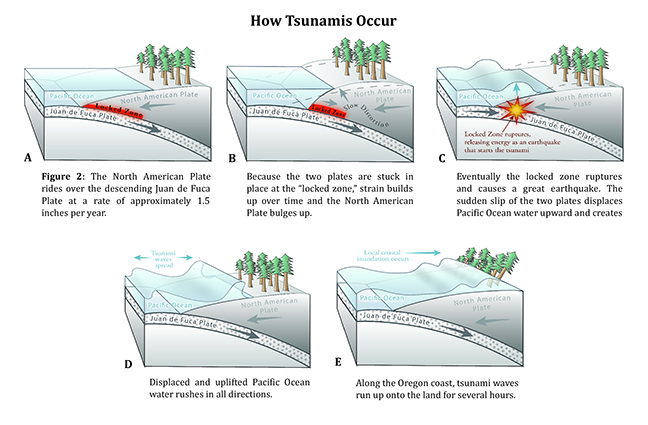 The above graphics illlustrate how a local tsunami is generated and were also included on DOGAMI’s Tsunami Inundation Maps. The graphics above are a simplified depiction of the Mount Mazama eruption and the creation of Crater Lake. They were included in the Crater Lake Geologic Guide and Recreation Map. The illustration above was used as part of the Bull Run Landslide Inventory and shows the prevalence for landslides to occur in the Rhododendron Formation of the watershed. This graphic illustrates the different variables that make up the channel migration zone and was used in DOGAMI’s channel migration maps.